Vexcel Imaging, a leading provider of digital large-format aerial cameras, recently held their annual UltraCam user conference in Italy and production staff from both our UK and Cape Town offices attended the conference. Getmapping own two UltraCam Eagle cameras which are produced by Vexcel Imaging and over the past 18 months we have also invested heavily in the fully integrated photogrammetric UltraMap workflow software for image processing, helping us to increase production throughput and capacity. 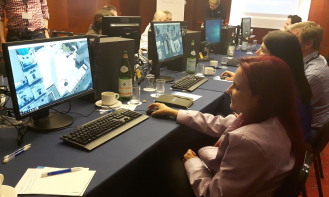 Production staff from our UK and Cape Town offices attended the conference in Rome, enjoying workshops, technology previews and demonstrations. The 2 days also provided a great opportunity to meet with both the Vexcel team and other UltraCam and UltraMap users. Vexcel shared a roadmap of future hardware and software developments and the Getmapping enjoyed getting stuck in! Vexcel introduced the upcoming release of their UltraMap software, providing a hands-on demonstration of upgrades and features. This is a major software release which includes a module for colour balancing and de-hazing, full integration of 3D Visual Analytics into the Aerial Triangulation module and a module that allows the export of a 3D textured TIN from UltraCam data. 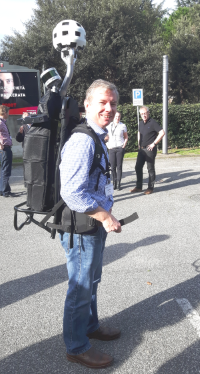 The Getmapping team were able to take part in a hands on demonstration of the UltraCam Panther mobile mapping system, demonstrated here by our Operations Director Martin Tocher. This is a backpack mounted system that simultaneously captures 172 Megapixel georeferenced spherical video or still imagery, precision LiDAR 3D data and highly accurate geopositioning information. Overall it was a great conference providing lots of opportunities to try out both new camera kit and the latest software developments. Thank you Vexcel Imaging, we look forward to future user group meetings.